First off, let me say it’s hard to believe my journey into the world of beer blogging started less than a year ago. I’ve had the opportunity to enjoy a lot of amazing beer during the past 12 months and have been really humbled and excited to see so many people take an interest in what I have to say. I really enjoy being part of the conversation (and sometimes debate) and have seen things grow faster than I could have ever imagined. So, on my last post of the year, I want to sincerely thank everyone for reading, tweeting, commenting, trading, sharing a beer with me and, frankly, making me feel welcomed. Cheers to all of you. With that being said, beer blogger law dictates I must compile a “best of” list to finish out the year. I scoured through my archives and compiled a list of the best new beers I’ve had this year. Mind you, this isn’t the best beers I’ve had for the first time – I did go to Belgium and drink Cantillon and Wesvleteren, after all – but the best new beers I’ve grabbed off the shelves since January. It was rough whittling the list down to just five, but here’s what stood out to me the most. You can’t deny that the folks at Stone know what they’re doing when it comes to hoppy beers. They’re the masters of it, plain and simple, and in 2012 they proved that time and time again. 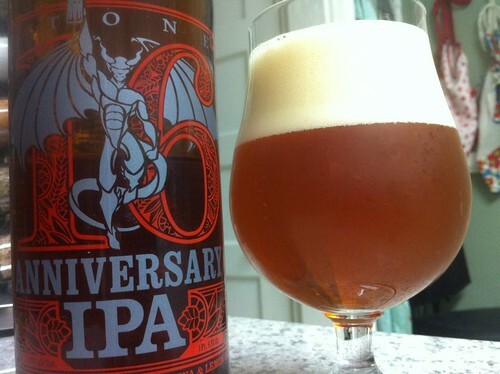 I loved the 10th Anniversary edition of their Ruination IPA, but they killed it with their 16th Anniversary IPA. A 10% rye IPA made with a helping of Amarillo and Calypso hops and then rounded out with lemon verbana, it immediately became one of the best DIPAs I’ve had, and I love DIPAs. A rich, flavorful mouthfeel, an incredible nose of spice, lemon and tropical fruits and that abrasive, biting hop presence I expect from Stone were all there. It was everything I could have hoped for in DIPA, and everything I would expect from one of my favorite breweries. When I first found out Oskar Blues would be putting out a bigger, hoppier version of Dale’s Pale Ale – one of my all-time favorite beers – I felt like a kid who just found out my parents were taking me to Disney World. (That is, insanely excited.) It was one of those beers I wanted to have so badly that I had a friend pick me up some from another state because it wouldn’t be distributed around me until a few days later. My impatience paid off as the beer lived up to all the hype I had created in my head. To say Deviant Dale’s is a piney hop bomb is putting it lightly. Just pick up a handful of pine straw, shove it in your mouth and viola! That’s what you get from drinking this beer. That may sound off-putting, but for hopheads like me, it’s perfection. Coupled with luscious tropical fruit flavors and just enough carbonation to cleanse the palate, this is one I come back to time and time again. 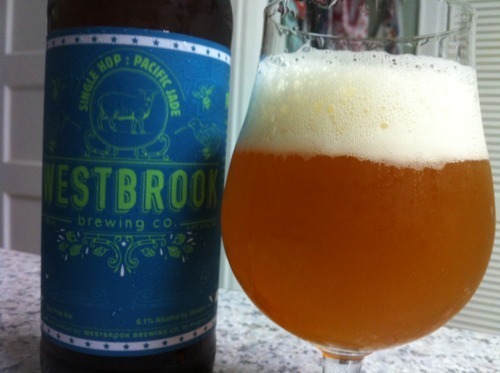 Picking which entry in Westbrook‘s Single Hop series is best is like asking which child you love the most: You know in your heart it’s easy to pick one, but you feel bad for the others. To be fair, the series has wowed me time and time again since its inception earlier this year. Amarillo and Nelson Sauvin were each fantastic in their own separate way, and I would put Citra in this spot, but I can’t count it since it was released last year under a different name. So, with those factors in mind, Pacific Jade was the one that stood out to me the most. New Zealand hops are all the rage right now and showcaseing Pacific Jade gives that hype credence. The tropical fruit tastes and rye bite were great, but the starfruit flavors were what stood out to me and put this one over the top. It’s an incredibly unique and flavorful hop that I have a much better appreciation for thanks to the series. I don’t give saisons nearly as much love as they deserve, but along with stouts and IPAs, it’s one of my top 3 favorite styles. 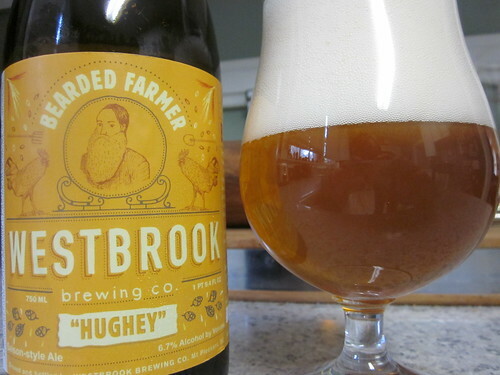 And while Westbrook’s new Bearded Farmer series of saisons isn’t classic by any stretch, it does an excellent job of blending the creativity of the brewery with an already playground-worthy style of beer. Hughey, the first in that series, wowed me when I first had it, and I feel as if my review could have been twice as long. There was so much going on with this beer, and it certainly concerned me that it would all get muddled together in the end. But the finished product was shockingly good and – surprisingly enough – each piece of the puzzle stood out. The Belgian and French yeasts each imparted their own flavors, as did the variety of malts. As with any good saison, it’s great now, but develops beautifully over time as I’m sure Hughey will. Where as the Single Hop series stripped things down, the Bearded Farmer series ratchets things up with amazing results (so far). There’s a lot of promise in this series, and you’ll certainly see me delving into more entries in 2013. 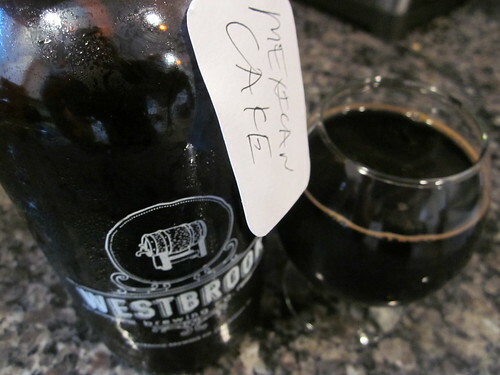 If you’re a fan of South Carolina beer, you know all too well the lure and fanfare that surrounded Mexican Cake – Westbrook’s 1st anniversary beer – when it hit shelves back in January. At that point, the 1-year-old brewery was still going through some growing pains – over-carbonation, infection, etc. – and people were skeptical about a pepper-heavy imperial stout. But what started out as a sleeper hit among SC beer geeks soon exploded into a widely sought and highly demanded beer. As it damn well should have been. Mexican Cake was a sort of sea change for Westbrook. Among my friends and others I encountered, the Mt. Pleasant brewery was regarded with a little bit of disdain. Whether it was personal feelings about the brewery staff or a ho-hum attitude toward the beer, I never saw anyone get excited about a Westbrook release. That changed once Mexican Cake hit – and subsequently disappeared from – store shelves. People went insane for this beer, and since then the brewery hasn’t let up. This was the year of Westbrook. From becoming a home for Evil Twin to the Single Hop and Bearded Farmer series, they’ve just done one awesome thing after another all year long. As for the beer, having had it at different points throughout the year, I can say it still amazes me now as much as it did the first time I had it. A velvety rich and smooth body floods your palate with dark chocolate, dry cocoa and cinnamon before scorching your throat with the burn of Habanero peppers, forcing you to take another sip in a perpetual cycle of enjoyment. While the burn of the peppers has faded with time, the appeal and superb quality of Mexican Cake has stayed. This remains one of the best beers I’ve ever had, and there’s really no competition: Mexican Cake is my favorite new beer of 2012. Honorable Mentions: Sierra Nevada Narwhal, Bell’s This One Goes to 11, Dogfish Head Positive Contact, Sixpoint Resin, Southern Tier 2XMAS, SweetWater 15th Anniversary Ale, Terrapin Samurai Krunkles, Westbrook Brett & No Mices, Sixpoint Apollo, New Belgium/Alpine Super India Pale Ale, Westbrook Cap’n Skoon’s Ballistic Stout and probably many more. It’s always great to see a new brewery begin distributing in South Carolina, and 2012 has been one of the strongest years in recent memory. During the past 12 months, Founders and Foothills have returned to the Palmetto State after a too-long absence, Coast and Holy City upped their distribution to the Midlands area, and a wealth of new breweries began distribution. Since January – and this is off the top of my head – Green Flash, Aviator, Anderson Valley, Breckenridge, Goose Island and Lazy Magnolia have all found a home in South Carolina. (I’m sure there have been more, but they escape me right now.) While there’s no indication of who will be the next to announce distribution here, 2013 will certainly see a few new breweries pop up. That got me thinking of which breweries I wanted to see distributed in South Carolina. After perusing my Untappd profile and weighing the options, I’ve compiled a list of the five breweries I hope to see distributed around here sooner or later. But for the following breweries – all of which already have or will soon have a home in surrounding states – it’s reasonable to assume they could move into South Carolina fairly easily, and if the market demands it. So, in no particular order, here’s who I’d like to have ‘round these parts. Ever since then, I’ve been hoping to get another taste. Which I have … during trips to Georgia and North Carolina, where the brewery is distributed in the Southeast. Fortunately, instead of starting out with just core brands, those states have gotten seasonal offerings as well as the Smokestack Series, which is where they shine. The Tank 7 Farmhouse Ale, Long Strange Tripel and Dark Truth Stout are all superb, and I have a bottle of their Sixth Glass quad taunting me in my fridge. Boulevard has a sort of nostalgia for me. Aside from being excellent, I first got to try them on one of the most memorable trips of my life. Seeing how quickly and robustly they debuted in surrounding states makes me think it won’t be too long before we see them in South Carolina. Another great brewery that taunts me from just across the state line is San Francisco-based 21st Amendment, named – of course – for the amendment that gave America beer yet again. As with Boulevard, both North Carolina and Georgia receive 21st Amendment regularly, which means I’ve had the opportunity to have every one of their regularly released beers time and time again. And time and time again, I am consistently pleased with what they put out. Hell or High Watermelon is one of my wife’s favorite beers. No matter where we go or what season it is, if she sees a six-pack, she’s going for it. I prefer the oak-aged Hop Crisis DIPA or the insanely complex and even more insanely delicious Monk’s Blood, but everything they put out has never disappointed. It’s good to have friends in high places, or at least friends in higher places on the map. Especially if they live right around Brooklyn, home of Sixpoint. For me, it means tallboy canned goodness from the formerly draft-only brewery arrive via beer mail on the regular. Outside of the Northeast, it’s hard to find anything from Sixpoint. But that will change soon as the brewery recently announced they’ll begin distributing in Atlanta, which is generally viewed as a major test market for the Southeast. While they’re still a really small brewery, it’s reassuring to know they’re taking an interest in my neck of the woods. At this point, I’ve tried two seasonals – Autumnation and Apollo – and two of their newer core beers – Resin and Brownstone – and the brewery is 4-4 with me. As I write this, I have a back of Diesel (another one I’ve had but not reviewed) en route from New York. Based on the word that this year’s batch is much improved, I suspect they’ll be 5-5 soon enough. It’s hard to pick which brewery I like more: Port, which generally focuses on big West Coast-style beer, or TheLost Abbey, which specializes in Belgian-style offerings. Fortunately, I don’t have to choose between one or the other, because if the San Marcos, CA, brewery ever gets around to crossing to South Carolina from Georgia or North Carolina, we’ll likely get both. When it comes to hoppy beers, Port excels. Their Wipeout IPA and Mongo DIPA are both just so damn good and incredibly strong West Coast beers. But they’re not limited to hoppy beers. Old Viscosity was superb, as was Older Viscosity, which I enjoyed the night before my wedding earlier this year. And being a fan of Belgian-style beers, The Lost Abbey has always impressed with with a different take on some classic styles, such as their Judgement Day quad and the Ten Commandments Belgian strong ale. And the stouts I’ve had – Serpent’s Stout, Deliverance – have been phenomenal and made it incredibly hard to not crack open the bottle of Angel’s Share I have in my cellar. Who would have thought the heart of Mormonism would be responsible for some incredibly inventive and tasty beers? That’s exactly what Utah-based Epic Brewing has been doing in just a few short years. (Don’t confuse them with the New Zealand brewery of the same name, which is also great.) These guys aren’t playing around with their beers either. They specialize in big beers in more ways than one. Most of the beers I’ve had from them come from their limited Exponential Series, including the Sour-Apple Saison, Elder Brett, Brainless on Peaches, Fermentation Without Representation and the almost-too-good-for-words Big Bad Baptist. Specializing in big over-the-top beers can sometimes backfire, but Epic does it right. They’re not big for the sake of being big. They’re trying to up the game and bring the respective styles up a notch. 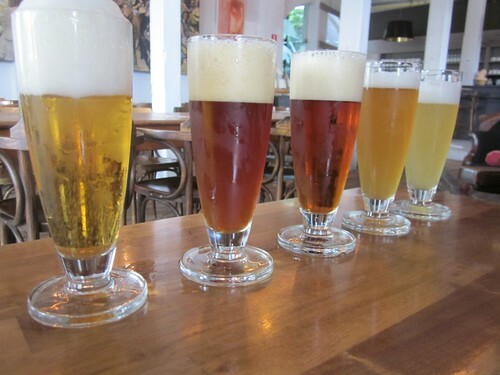 Their beers are intensely flavorful, creative and – most importantly of all – incredibly enjoyable. Welcome to Planet Hype! Black Tuesday, Darkness and Kate the Great on Aisle 1. Westy 12 on draft. It’s hard to say exactly where the hype surrounding any particular beer begins, and why some beers get much more hype than others. Does it begin with the brewery when they announce they’re concocting some quad-hopped bourbon wine whiskey barrel-aged imperial IPA double stout brewed on the peak of a mountain? Does it start among friends with the both half-mocking, half-bragging, “What do you mean you haven’t tried the Pliny/Black Tuesday hybrid?! It’s soooo good!” Or is it a mix of both, with insatiable beer drinkers lining up for days to get the latest and greatest from their favorite brewery, only feeding the beast that much more? How much does hype affect a beer? There’s no denying there’s a wealth of hype in the beer world. Every few months, some new bottle is released to much fanfare. People line up for days on end or buy buckets of raffle tickets or stay glued to their computer screens just for a chance to buy a bottle of The Bruery‘s Black Tuesday or Three Floyds‘ Dark Lord, or even just a glass of Russian River‘s Pliny the Younger. Hype can be a double-edged sword. On the one hand, it can build up a brewery’s clout and help elevate a style. For a smaller brewery not often mentioned in “best in the world” discussions, it can help grow their profile. That’s true in the Carolinas with breweries such as Foothills, a great brewery that might not get much attention outside the Southeast if not for their excellent Sexual Chocolate Imperial Stout. And as they say, competition is a good thing, and having a brewery put out a “Pliny killer” or some barrel-aged imperial stout that people go gaga for can cause other breweries to step things up and try to top it. On the other hand, it can almost deify a brew in a way, giving it gargantuan and mythic qualities. When it come down to it, it’s just water, yeast, hops and grain. It’s not the Holy Grail. There was a time not that long ago when I did my damnedest to make it to every bottle share or tasting in hopes of tasting a white whale or something super rare. My mentality’s changed since then, settling into the ol’ “It’s just beer” groove. If I don’t have hyped beer A, I’ll likely have hyped beer B at some point, or some beer equally as good that has no hype surrounding it. What does it mean if a beer doesn’t live up to the hype? I’m going to get into this by delving into two different experiences with two massively hyped beers: Russian River’s Pliny the Elder and Westvleteren 12. Before I discovered and became involved with beer trading, I participated in the shunned practice of buying beer off eBay. In my defense, I didn’t have a network to traders yet or a sizable cellar, so I didn’t have much to go on and figured just buying it would be the easiest thing. One of the first bottles I bought was Pliny, because 1) I’m a complete hophead and 2) the hype surrounding it had sold me. It did not disappoint. I shared it with a few friends at a Halloween party last year and everyone agreed it lived up to the hype. This thing is, I hadn’t necessarily hyped Pliny up to epic proportions in my mind. I really wanted to try it, but I didn’t think it would be the end-all, be-all imperial IPA. I was just excited to try it. It’s a very subjective question and not one that’s easily answered. What I think is that the lure of Westvleteren beers creates a manufactured importance, and people certainly get caught up in the hype. It’s hard to live up to the expectations you have in your head. That being said, Westy 12 – as well as Blond and 8 – are truly phenomenal beers. Is Westy 12 the best beer I’ve ever had? No. Is it one of the best beers I’ve ever had? Absolutely. Is it the best quad I’ve ever had? It’s a definite contender. Westy 12 certainly didn’t disappoint me, that much is certain. But I absolutely got caught up in the hype and lure of the beer, and maybe at the time I had convinced myself it was a better beer than it actually was. You’ll never get this! But that’s OK.
With Westy 12 getting (legal) distribution in the U.S. for the first time, I’ve had a lot of people ask me if it’s worth shelling out $90 for six bottles and two glasses. If you have some extra cash and want to treat yourself, I say go for it. Save the extras for bottle shares and people will really appreciate it. However, that $90 might better be spent on bottles of St. Bernardus Abt 12, or Straffe Hendrik Quad, or Rochefort 10. They’re all Belgian quads, they’re just as good as Westy 12, they’re available everywhere and they’re pretty affordable. And the best part? They’re not hyped at all, and a lot of times, those are the beers that deserve the most attention. Just a cursory glance through my archives will show you how much I enjoy pumpkin beers. It’s my favorite style of the season and one of my favorite styles period. So it pains me to say I won’t be able to make it out to Pumpkinfest tonight at World of Beer in The Vista. But you should. In addition to having a great lineup of pumpkin beers on tap, they’ve promised Southern Tier Pumking ice cream. Yes. Pumking ice cream. Dreams do come true. World of Beer is located at 902 Gervais St. in Columbia. When it comes to blogging about cooking and baking, I’ll leave that to my wife. But when it comes to pairing food with beer or cooking with beer, I figure I can let it slide. Using beer as an ingredient in a recipe is a fairly new concept to me but one I’ve found that works pretty well. Unlike pairing foods with beers, where one compliments the other, cooking with beer infuses the flavor of you brew of choice with the rest of the food. I don’t have too much experience cooking with beer aside from cooking while drinking, but every once in a while I stumble across a recipe I decide to try out. 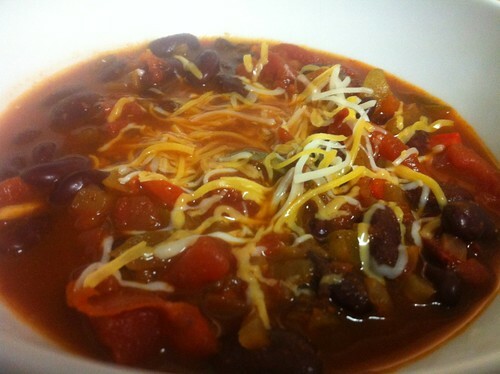 A while back I did a macaroni and cheese made with Sam Adams‘ Latitude 48 IPA, and last week I decided to try making a quick vegetarian beer chili using a recipe I found on The Mash, the blog of the Brooklyn Brew Shop. It’s fast, easy and – best of all – uses whatever beer you want. 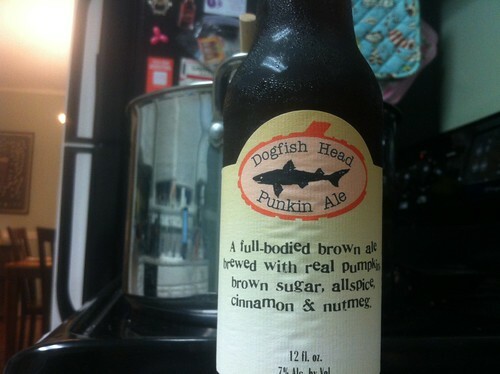 For the beer, I selected Dogfish Head‘s Punkin. With all the spices going into the chili, I figured the flavors of Punkin would be a nice complement, and the flavor of the pumpkin would add a good flavor as well. But I imagine it’d work just as well with something roasted or rich. Step 1: Finely chop the bell peppers, onions and jalapeno (after removing the seeds) and saute them in a large pot over medium heat until they’re soft. Step 2: Add chopped garlic, cumin, coriander and chili powder and saute for a minute or so. 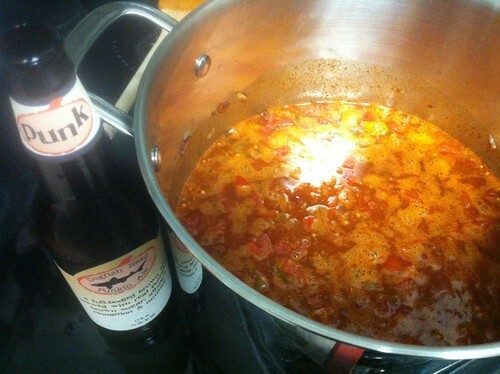 Step 3: Add the cans of diced tomatoes and kidney beans and the bottle of beer and increase the heat to medium high. 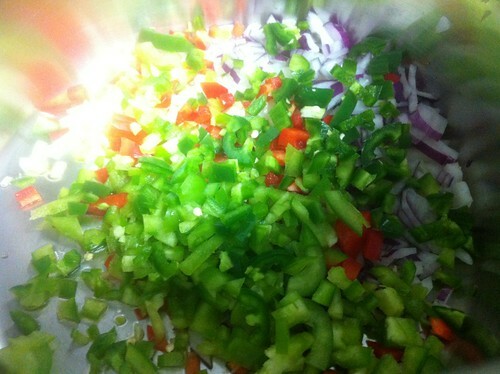 Step 4: When it begins to boil, turn the heat to low and simmer for about 20 minutes. While the flavors of Punkin didn’t really stand out, there’s definitely that sweetness from the pumpkin mixed in with everything else. None of the spices are very strong, but it does have a nice burnt and roasted note to it. It leans a little more toward the sweet side, but all in all a good and easy recipe. 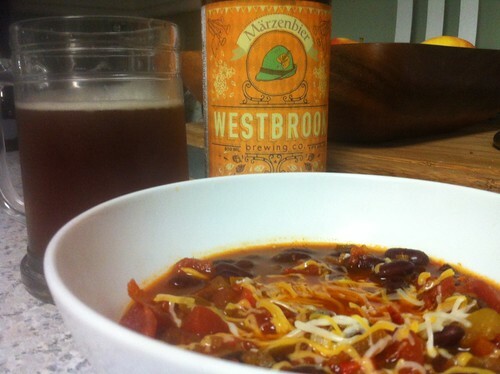 I paired it with a bottle of Westbrook‘s Marzenbier, which worked perfectly with the chili. The sweetness of the malt in the beer blended nicely with the chili flavors, and the breadiness also worked well with the richness of the tomatoes and beans. All in all, it turned out pretty well if I do say so myself. I’m taking a break from reviews this week to focus on my recent honeymoon in Brussels, Belgium. During the next few days, I’ll be covering my thoughts on the culture, the craft and – of course – the amazing beer and breweries my bride and I enjoyed while on our trip in what many consider to be the mecca of beer. After hopping around Brussels for a couple of days, my wife and I decided to plan a couple of day trips to other cities nearby to see some of the other sites. And, of course, the other breweries. On our third day, we hopped a train to Bruges, which is about an hour outside of Brussels. 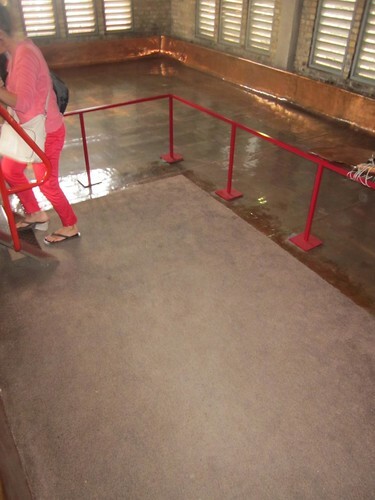 We climbed the 366-step bell tower, browsed the open-air central market and made nice with a few other tourists. In case you’re wondering, the city is much nice – and much less violent – than “In Bruges” makes it out to be. 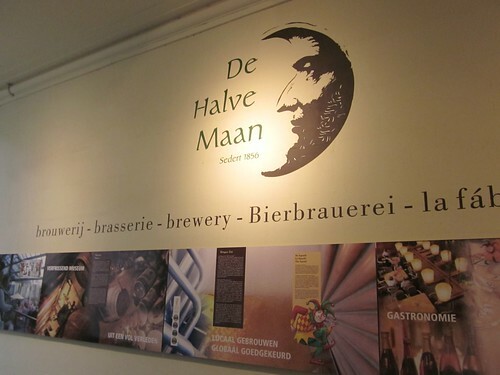 Bruges is also home to De Halve Maan (The Half Moon), Bruges’ only active family owned brewery which really came to be in the mid 1800s. 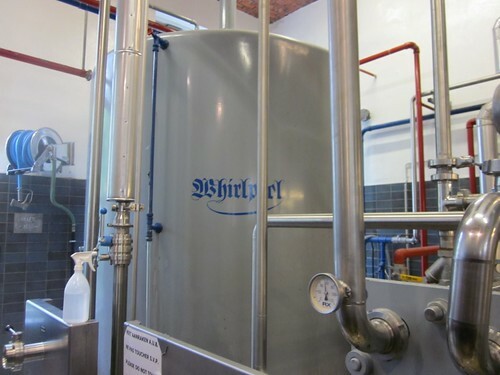 During the past few centuries, the brewery has grown and modernized, going through some tough times but reopening in 2005 and still going strong. 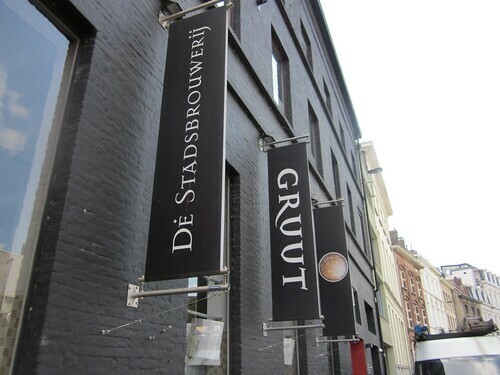 An open-air beer garden sits outside while a cozy and modern tasting room that serves the brewery’s four beers: a blond and dubbel under the Brugse Zot brand and a trippel and quad under the Straffe Hendrik name. 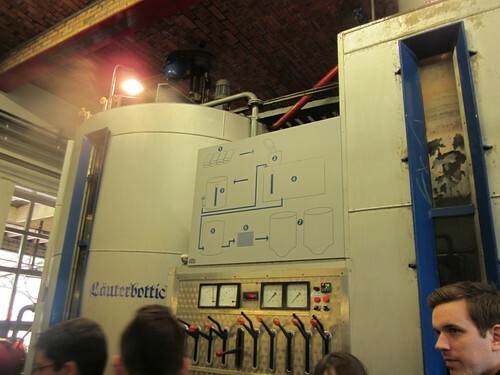 But before we got to the beer, we took a tour through the modern and original brew house. 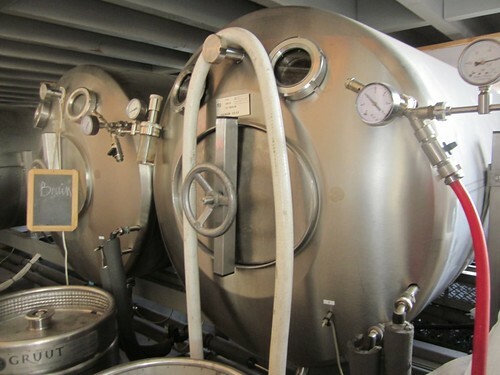 When you first walk in, you stand among all the expected brewing equipment. If you’ve been to a brewery, you know how it all works. 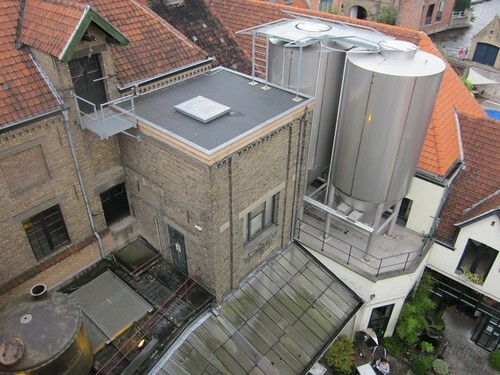 From there, it’s up a series of staircases through the original brewing equipment. 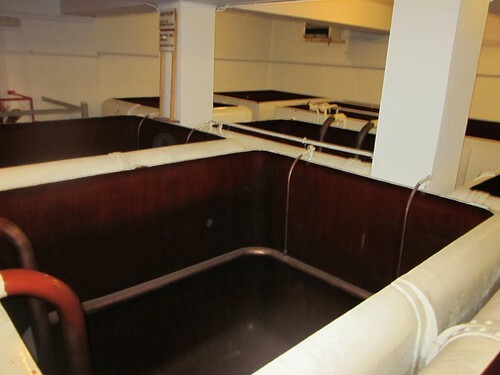 There was the upper loft, where they kept all the hops and grains; the roasting room, where all the grains were heated just right (as well as a mirror pointing up the original exhaust shaft); the original coolship, where all the beers were once cooled; the original brew kettles; and eventually outside to the top-most point, where you can look down on the old and new brew house. After all the walking, we were left to our own devices in the tasting room. The Brugse Zot Blond was a classic blond with a peppery bite. The Brugse Zot Dubbel was rich with carbonation and big flavors of plums and toffee. The classic were great, but the big boys were the ones that really shined. The Straffe Hendrik Tripel had a really interesting tropical fruit note with a caramel coating. But the big daddy – the 11% Straffe Hendrik Quad – was one of the best quads – hell, one of the best beers – I’ve had. Massive carbonation, a gigantic punch of brown sugar and figs and nary a hint of alcohol (until after you down it). There was a barrel-aged version in the gift shop for sale, but sadly, I made the decision to buy it right after the last bottle had sold. The following day, we made another day trip to Gent, which is about halfway between Bruges and Brussels. There aren’t too many touristy things in Gent, so we just wandered the streets and shops and scoped the place out. 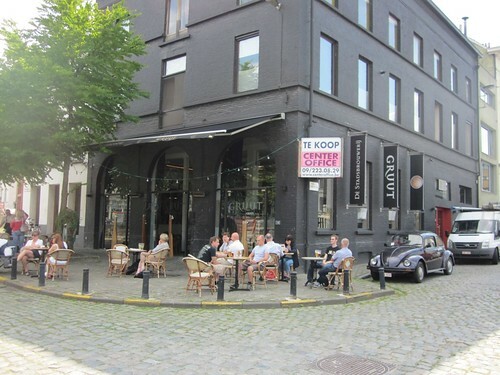 We happened to stumble upon Gruut, Gent’s city brewery. 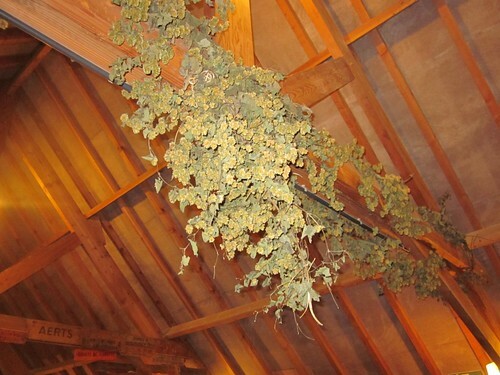 The brewery gets its name from the coinage once used to purchase gruit, a herb similar to hops. 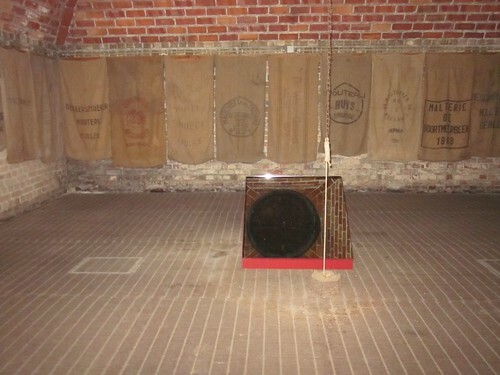 (An image of one of the coins is used as the brewery’s logo.) 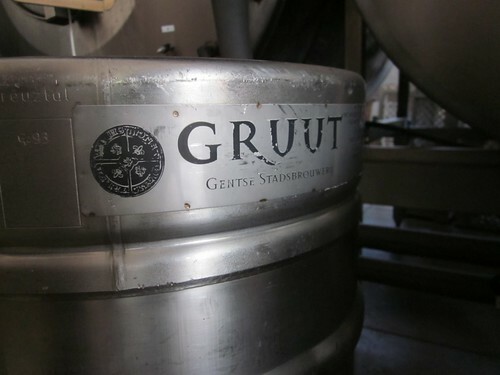 To honor their history, Gruut uses the gruit herb in their beers in place of hops. It’s a specialty spice that has a lot of similarities to hops, and in the beer tastes like a slightly less pungent hop. 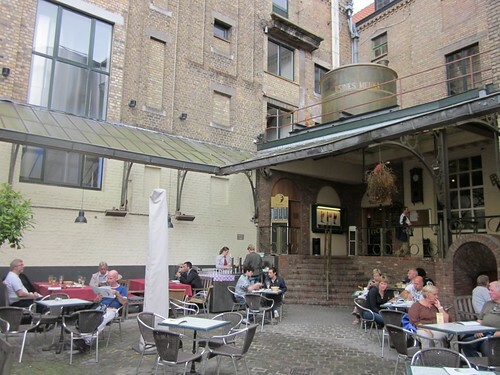 The brewery itself, which lies at the corner of two canals, is extremely modern inside, and resembles more of a cafe than a brewery. 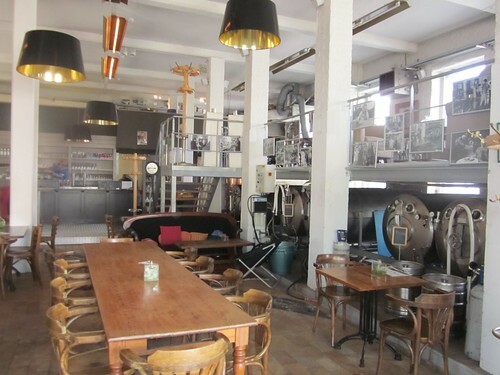 There are tables scattered outside and inside along with the brewing equipment. It’s very clean and modern, and on a nice day like the day we visited, was the perfect place to pop in for a couple of drinks. With five beers on tap and us wanting to try a bit of each, my wife and I decided to go for the sampler, which cost just a handful of euros. We were expecting small tasting glasses to get just a nip of everything, and then we’d purchase full drinks. Well, the Belgians don’t play around. The “tasters” we received were five full-pour 12 oz. glasses of each of the beers. Gruut Inferno, their damn-impressive 9% trippel with huge carbonation and a big, spicy punch of rosemary and sage. Having never heard of either of these breweries stateside, I was floored at how good their beers were. Even the standard fare such as blonds, browns and ambers – the standard three beers for nearly all Belgian breweries – tasted better than the vast majority of their American brethren. 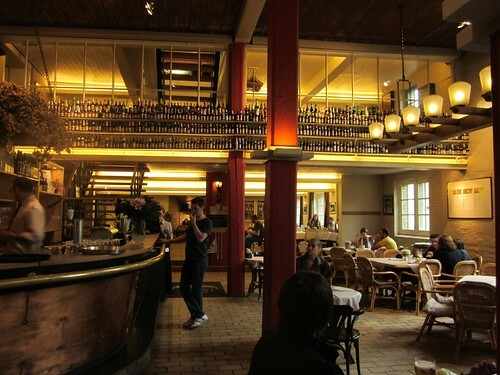 They’re hidden gems among the Cantillons and trappist breweries that usually grab the attention of folks in the states. Because of beers like the ones I had at De Halve Maan and Gruut, I’m now a little more inquisitive about and apt to try Belgian beers I’ve never heard of before. When I first started this blog a few months ago, it was on a lark. I figured I would be real hyped about it for a while and go full-bore, but then slowly lose interest and let it die out. I figured none of my friends would care, and I’d never get a following. Boy, was I wrong. What started out as an off-the-cuff idea has grown into something that people have taken an interest in, not only locally, but also from much farther away. My Twitter feed is gaining new followers every day, and I’ve noticed a steady increase in traffic during the past few months. I’m not massively popular and I never suspect I will be, but it’s been encouraging. So that leads me to this: A new blog with its own domain and a move from Tumblr to WordPress. I’ve been tinkering with WP all week – if you follow me on Twitter, you know I’ve put out a few beggars for help – and while I’ll still try a few nips and tucks as far as appearance goes, I’m happy with the simple, clean look I had with the Tumblr blog, a look I’ve tried to duplicate here, but with more content. The Tumblr will still stay active for linking purposes, but this will be my new home from here on. Speaking of content, I’m going to try to give a bigger pushing what’s going on in the Columbia, SC, area. With Conquest coming online soon, World of Beer and Flying Saucer hosting more events and Green’s renovating its growler system, there’s a lot of growth in the beer community locally, and I want to try to be more of a part of it. But as always, this is all done for fun and in hopes of exposing people to something new. I don’t have an ego about all this, and I’m humbled to have even one person pay attention. It’s the same DBR as before, just with a new home. Cheers. Thanks for reading, and welcome to http://www.drinkblogrepeat.com.